The slow and steady progress towards having a web application ready to go live continues. This week, I’ve added recaptcha to form submissions and cleaned up routing to allow for urls such as /KnowledgeBaseArticle/ArticleDetails/KB0011703 as opposed to /KnowledgeBaseArticle/ArticleDetails?query=”KB0011703 “. The branding is also in the process of being redone, being carefully designed to fit seamlessly with the existing iSolutions website. It will, as far as the users are concerned, simply be a new section of the website, with all of the menus and navigation options remaining identical. This has proved more difficult than I would have hoped simply because the templates and standards I expected don’t exist. I was provided with a link to a json file that is supposed to represent the core university and iSolutions navigation bars, but on further inspection, they don’t quite match up to what’s displayed on the university website and one of the navigation bars isn’t represented in the json at all. When I asked about this, one of the responses I got from another iSolutions web developer was along the lines of “you can always add static links, just keep an eye on them, I’ve done it for projects before”. And when I explained that I don’t want my website to fall behind and no longer work properly after I leave, I was told “that’s normal, all websites stop working at some point”. As an inexperienced web developer, perhaps I came into this field too optimistically, and expecting more from existing systems than is entirely reasonable. Perhaps a future project, for either a full time employee here or another intern, would be to standardise the navigation across the university website and to provide a template to the entirety of iSolutions that can be updated in one place, instead of getting people all across the company running around trying to clean up the fallout whenever a minor change is made to the core website. We all work to avoid code duplication in our own projects, but if we could work to avoid code duplication across all projects then our systems would work better, and we’d all spend a little less time reinventing the wheel and a little more time on the interesting innovative work that really matters. I was strongly in favour of splitting the services provided using open data and access to the open data itself in order to allow for non-technical students to use the services more easily with less risk of getting scared away by technical jargon and data they have no interest in using. At first this idea seemed to be seen as too much work for too little value, but in my mind it was simply a case of moving links around and bearing in mind whether a page should be targeted at technical individuals or not. By the end of the session, it was agreed that the navigation menu should be split between technical and non technical details, and that links between the two should be minimal. I’m glad that I managed to get my point of view heard, and I really think it will help with engaging technical and non-technical students alike. Even computer scientists like things to be organised every now and then. 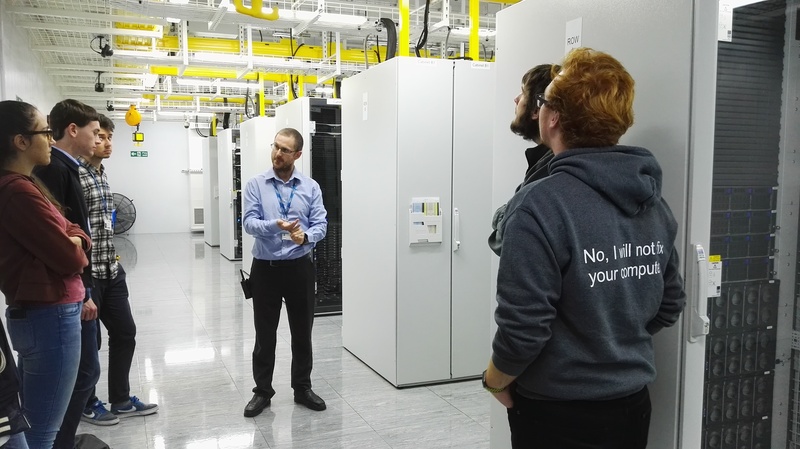 That wasn’t our only field trip this week, we also had an intern-wide trip to the data centre. It was really interesting to see where all of the university systems are running, and the technology involved is incredible. 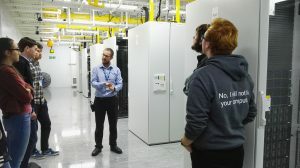 The entire building has been kitted out specifically to deal with super computers and server racks, with underfloor and overhead cooling, and the most thorough anti-fire precautions I’ve ever seen in my life. As cool as it was to see this kit in action, I felt thoroughly out of my depth. I’m not a hardware nerd, and when people describe engineers as people who have been taking apart machines since they were children I never feel that that really describes me. I’m a software engineer through and through, I preferred decision maths to physics at school and nothing’s changed. I’m grateful to have been able to seen this kit, but the talk we were given about the specs of various machines and the mechanics of the system supporting them all went over my head.